We just had a great third team meeting! After going all of the important team dates, we we divided into three groups to discuss ways to promote the math team, the HMMT competition, and the PUMaC competition. We determined that just about everyone is interested in participating in both competitions. The good news is that I was able to submit applications for two teams for each competition and I had a roster spot for everyone! Don’t worry if you can’t 100% commit to a given competition right now. We’ll work out those details at our next meeting which will be held on Monday, 10/6 in Schoolhouse 25 from 2:50 to 3:30pm. Meeting minutes were recorded in our Math Team OneNote notebook. 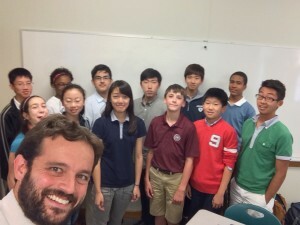 Anyone is welcome to join the Math Team at any time, regardless of age or mathematics level. Interested students should email me at jseamon@williston.com and fill out the short signup survey. 1) Members must make every reasonable effort to attend every weekday club meeting. If a team member must miss a meeting, that information must be communicated to Mr. Seamon before the next meeting. This would lead to an excused absence. 2) If a team member misses more than 2 club meetings in any two-month period (unexcused), they will be put on probation for two months. 3) While on probation, if a team member misses more than 2 club meetings in any two-month period (unexcused), they will no longer be considered a member of the Math Team. Our next meeting is on Tuesday, 9/30 from 3 to 3:30pm in Schoolhouse 25. OneNote notebook setup: Every team member should have access to the Team shared notebook. If you haven’t received an email giving you access, please let me know. We worked on some problems from the 2014 AMC 12B exam which proved to be really entertaining. They are phenomenal prep for all sorts of math competitions. We talked about our first off campus non-competition trip. The plan is to take a day trip to Manhattan (train in from New Haven) and spend the day at the Museum of Math and make a visit to Google NYC. There is certainly sufficient interest in the trip. A set date is coming soon! 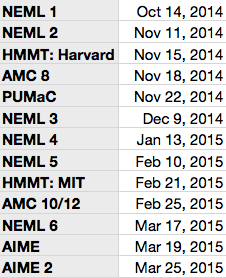 Our primary targets for off campus competitions are the HMMT (11/15) and the PUMaC (11/12). These are higher level competitions. We’ll be sending small teams (less than 10) to each event. Let me know ASAP if you’re interested in joining the team for either one or both of these competitions. Our next meeting will be on Tuesday, 9/30 from 3-3:30pm in Schoolhouse 25. This morning I gave an announcement in assembly promoting the launch of the Math Team. Something that’s nothing and nothing that’s something. Sign up to join the team right here. The first ever Williston Math Team club meeting was held this afternoon! 15 students attended, spanning all grades (7-12!) and math classes (Algebra through AP Calculus)! We can’t wait to get started! 1) If you’re interested in joining the club, please fill out this short online basic info survey. 2) The club is going to meet on BLUE Tuesdays from 3:00 to 3:30 and on GREEN Mondays from 2:50 to 3:30. All club meetings will be held in Schoolhouse 25. Anyone is welcome to join who has any interest in ANY level of math. 3) This coming school year we plan on participating in on campus competitions (AMC, NEML, Math Counts) and off campus competitions (HMMT, PUMaC). 4) Will be bringing in speakers to campus as well as presenting materials on our own areas of interest. 5) We will be making trips off campus to visit math related sights. 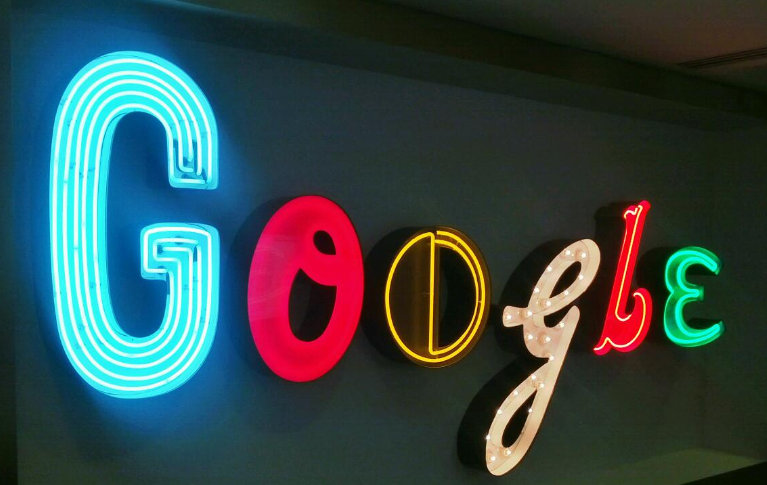 Our first trip will be to Manhattan to visit the Museum of Math and Google New York. 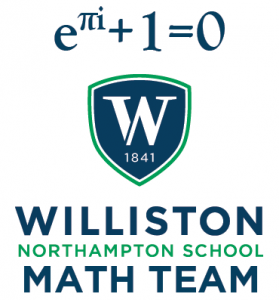 The launch meeting for the first ever Williston Math Team will be held on Tuesday, 9/16 from 2:50 to 3:30 p.m. in Schoolhouse room 25. At the meeting we will discuss the general structure of the club as well as which competitions we’re going to join. We’re currently targeting two or three on-campus competitions (NEML, AMC) as well as three to five off-campus events that will take place at places such as Harvard and MIT. Anyone who has any interest in elegant math problems is welcome to attend. You can be at ANY point in your study of mathematics to join the club.